Michele Carey Measurements, Height, Son, Net Worth, Where Is She Now? Home Actresses Michele Carey Measurements, Height, Son, Net Worth, Where Is She Now? By various standards, Michele Carey was one of the screen sensations of the 1960s and the good old 70s as well. Her role in the 1966 American Western film El Dorado where she gave life to the character of Josephine “Joey” MacDonald stands out from the rest. Did you know that Michele Carey had a child in high school and that acting is not her only forte? These and more interesting facts about the actress in a bit. She was named Michele Lee Henson upon her birth on February 26, 1943, which took place in Annapolis, Maryland, where her family was residing at the time because of father’s job as a wrestling instructor at the U.S. Naval Academy. Her father later went back to medical studies at Rochester, Minnesota, prompting the family to move – after his studies, he became Fort Collins’ first surgeon. Before she realized she would be good in front of the cameras as an actress, Michele Carey fell in love with the piano and went ahead to become a prodigy at it. As a result, she was able to lift the trophy at the Chicago Music Festival. She won the national contest when she was just 13 and later landed a performance with the Rochester Symphony Orchestra. When Michele had finished high school, she moved to Los Angeles in pursuit of a modeling career after signing a contract with the Powers agency in 1964. Modeling proved to be good business for the American beauty but her eyes were set on acting. An eye candy, Michele Carey didn’t have issues getting the attention of the right people in acting and soon, she charmed her way into Hollywood producers’ hearts and the roles started trickling in. Her first television appearances were recorded the same year she moved to the City of Angeles. She later made her film debut in the 1966 El Dorado, directed by Howard Hawks and produced by Western. Her role as a high-spirited troublemaker Josephine “Joey” MacDonald was received with rave reviews. Some of her film projects as a co-star include Live a Little, Love a Little and The Sweet Ride in 1968, as well as the 1970 Dirty Dingus Magee where she played an Indian girl. Michele Carey also garnered roles on television. At the onset of her career, she guest-starred on episodes of some television shows including The Man from U.N.C.L.E. (1966), Mission Impossible (1969), It Takes a Thief (1970), in addition to several other small roles in the late 1960s. 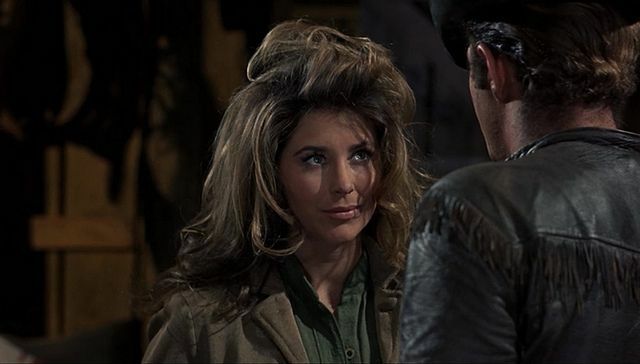 In 1972, Michele Carey was seen on Gunsmoke episode “Tara”, playing the title role. She also appeared in the second The Six Million Dollar Man pilot film the next year, Before she went MIA (missing in action), Carey was the recurring female computer voice in A Man Called Sloane which lingered from 1979 to 1980. After a brief hiatus in the late 1970s, the actress made her comeback in the mid-1980s, playing a role in the film In the Shadow of Kilimanjaro (1986) but before that, she played the role of Crystal in a 1982 episode of the television series The Fall Guy. Though she is no longer active in the entertainment industry, Michele Carey was able to rake in a fortune before taking her final bow. She may not have played a lot of major roles but she was able to amass an impressive $5 million in net worth. During her academic days at Fort Collins High School, Michele got married and had a son whose name was not made public. Carey did not share much about her personal life afterward, until in 1999 when she married businessman Fred G. Strebel. They lived as a family in Hillsborough and Rancho Mirage, until Strebel died on December 28, 2011. It was his death that led to the end of their marriage and it seems Carey never remarried. There is no verified information about the actress’ height and other body measurements but from the obvious, she has dark brown hair to go with her beautiful hazel eyes. She also maintained a fit body to further accentuate her beauty. Where is Michele Carey Now? Michele Carey has gone to a place of no return. The El Dorado actress passed on – 21st day of November in 2018. She died at 75 in Newport Beach, California, with her cause of death stated as natural causes. She lost her dad earlier the same year.